In a world where scientific research and technological innovation receive, on the whole, more than a trillion dollars of support from government and industry, the idea that the advance of knowledge and innovation can be understood separately from its political, institutional, cultural, and economic contexts is nonsense. This volume explores those complex interactions from a range of illuminating perspectives. Michael M. Crow has been the President of Arizona State University since 2002. He is co-founder of the Consortium for Science, Policy & Outcomes. Prior to joining ASU, he was executive vice provost of Columbia University, where he was also Professor of Science and Technology Policy. Robert Frodeman is Professor of Philosophy and founding director of the Center for the Study of Interdisciplinarity at University of North Texas. His work ranges across environmental philosophy, the philosophy of science and technology policy, and the philosophy of interdisciplinarity. Frodeman’s Sustainable Knowledge was published in 2013. David H. Guston is Professor of Politics and Global Studies and Co-Director of the Consortium for Science, Policy & Outcomes at Arizona State University. He is also the Principal Investigator and Director of the NSF-funded Center for Nanotechnology in Society at ASU. 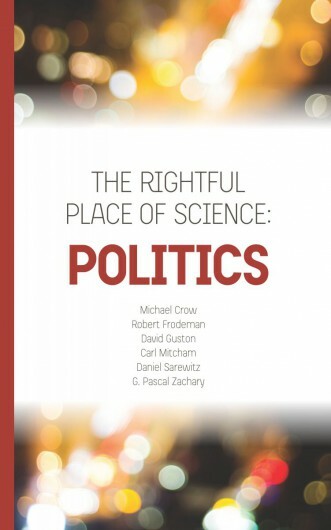 His book, Between Politics and Science, was awarded the 2002 Don K. Price Prize by the American Political Science Association for best book in science and technology policy. Carl Mitcham is Professor of Liberal Arts and International Studies, Director of the Hennebach Program in the Humanities, and Co-Director of the Ethics Across Campus Program at the Colorado School of Mines. Publications include Thinking through Technology: The Path between Engineering and Philosophy, and most recently Ethics and Science: An Introduction (with Adam Briggle). Daniel Sarewitz is co-director of the Consortium for Science, Policy & Outcomes, and Professor of Science and Society, at Arizona State University. His most recent book is The Techno-Human Condition (co-authored with Braden Allenby). He is also a regular columnist for Nature and the author of Frontiers of Illusion: Science, Technology, and the Politics of Progress. G. Pascal Zachary is the author of Endless Frontier: Vannevar Bush, Engineer of the American Century and Showstopper, about the making of a software program. He is a Professor of Practice in the Consortium for Science, Policy & Outcomes, and his articles on the politics of technology and science have appeared in the New York Times, Spectrum, Wired, and other publications. Zachary is editor of The Rightful Place of Science series.